I’ve posted a few times about the MXR Phase 90 “Script Logo” reissue over the past year but I haven’t mentioned the tried and true Block Logo (Model M-101) that’s been around for decades. We’ve offered the “Script mod” for many years; at $15 it reduces the gainy midrange hump that the pedal has and smooths out the overall sound of the pedal. The name is due to the modifications changing the pedal to closely resemble the original MXR Phase 90 with the logo written in a Script font. In addition to that we’re now offering a standard Overhaul which also include a toggle switch to select either Phase 45 and the stock Phase 90 sound, an Intensity Knob to decrease the intensity of the Phaser, and a modification so that the LED pulses the rate of the phaser when the pedal is activated. Priced separately these mods would be $110 at the current prices, but the Overhaul bundle is now being offered for $90. 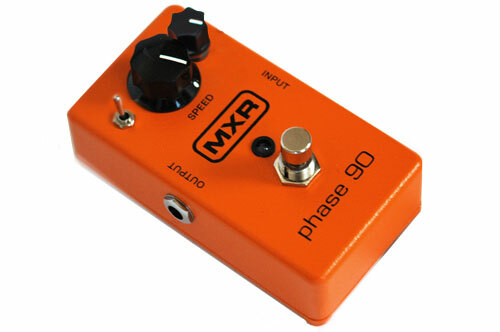 In addition to that, we have a used, premodded Phase 90 currently for sale at $130 on the Specials page.